BIG, small or Right Data: Which is the proper focus? For most businesses, having and using big data is either impossible, impractical, costly to justify, or difficult to outsource due to the over demand of qualified resources. So, what are the benefits of using small data? We find ourselves in the era of big data, where vast, continuous streams of heterogeneous human-related data are collected by digital means, and simplified for consumption according to the 5V characterization: Volume (size of the data), Variety (diversity of the content), Velocity (the rate it’s produced), Veracity (the quality of the content) and Value (it’s business impact). These humongous data sets are collected via many different means including computer networks, social media profiles, web browsing histories, mobile phone sensors, Internet of Things (IoT) devices, video data from (self-)driving and robotic applications, our commercial transactions and more. The complex task of processing and analyzing big data has pushed computer engineering and computer science on several fronts, such as distributed parallel processing (e.g., map-reduce and streaming architectures) and machine learning (e.g., deep learning). It has challenged our technological limits in data center design, computer processing, storage capacity and communication bandwidth. Although big data still has many significant research problems, sometimes the solution is just more data. However, for most institutions, having and using big data is either impossible, impractical, costly to justify, or difficult to outsource due to the over demand of qualified resources. But what exactly is small data? This question has been asked and answered so frequently it has multiple definitions: “Data that is small enough size for human comprehension” , “data that fits in a laptop” , “data in a volume and format that makes it accessible, informative and actionable” ; “the digital trace that each person generates” . For our purposes, all of these definitions are appropriate since they exclude big data applications. The most important reason to worry about small data is that most companies in the world will never have big data. Displayed graphically below, with companies plotted in one axis and the amount of data that they can gather in the other, we see that data generated by most companies forms the torso and the diverse long tail of data at large. 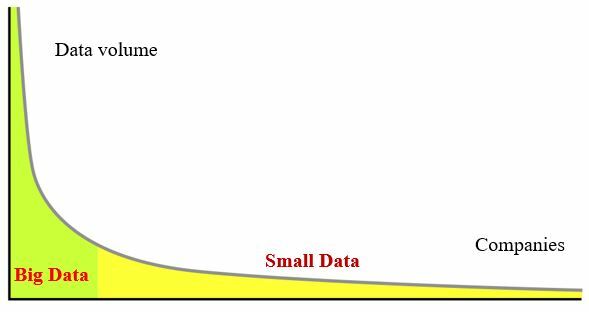 Most innovations are triggered by small data . Which type of data do I need? How much data do I really need? What is the best I can do with the data I have? What are the privacy issues on the data? Can I solve the problem in my smartphone? Is there any data bias and if so, how can I compare my results to other people’s results? At best, currently we have partial answers to these questions. However, many research problems beckon better answers or have no answers at all. Among them are privacy preservation, resource-efficient machine learning, adaptive and dynamic model selection, overfitting analysis, feature selection, specialized smoothing, error analysis, bias detection and calibration, better interpretability and causation analysis. In addition, while processing small data should be faster, in most cases there isn’t enough data to apply deep learning, spawning new problems such as bias, noise detection and correction, quantifying error and uncertainty, constrained modeling, and smoothing. To make matters worse, these problems have interdependencies with trade-offs that in most cases are not well studied. If we factor in that most target data is personal and lives in a tiny, portable device, then we must preserve privacy and/or resolve the problem in a device that has limited computing power, memory, communication, and energy. Scope - How exhaustive is the data related to the problem at hand? Resolution and Identity - How fine-grained is the data and how identifiable is each item? Relational - How easy is it to conjoin different datasets through common fields or encodings that are part of the data? Flexibility - How easy is it to extend the data (g., adding new fields) and scale in size? Privacy - How does the data relate to people? Table 1 compares small data with big data using 12 dimensions. Additional aspects of data might be important for most applications, including how data is collected, the technology and software used, the data ontology employed, and the context in which the data is generated . In this and other contexts, small personal data refers to information related to a living individual. Such data is normally associated with an identifiable person and might include first name, middle name, last name, address, telephone number, passport number, specific health or cognitive conditions, etc. In general, this data is private and hence the regulatory environment with respect to privacy, data protection and security is pivotal. As a side effect, there are two facts that make the use of personal data challenging for machine learning based applications. First, it is difficult to gather; personal data is considered private or sensitive and most people are not comfortable sharing it. Second, personal data related to mental, health and educational conditions is scarce because such conditions are infrequent, and often “hidden,” meaning they are not identified before the symptoms. Furthermore, most of these conditions (e.g., physical and mental illnesses, education disorders) are very much subject dependent. Their manifestations highly depend from person to person, making generalizations impossible. This means that data coming from some subjects might not be suitable training data for other individuals. As a result, the most suitable data to train an algorithm is the data belonging to the same subject, making the target data even smaller. Clearly more research is needed in addition to our current efforts at big data advances like the two main trends of distributed/parallel processing, and deep learning. We also need to explore the limits of small data and exacting its uses. Then we can learn if the right data, needs to be small or big. However, if 2013 was considered the year of small data , we are already late. Don’t wait another minute. Now is the perfect time to perfect it. Table 1. Comparison of characteristics of small data and big data (partly based in ). jWork.org (2014). "Small data". Never heard this term? URL: http://jwork.org/main/node/18. R. Pollock (2013). Forget Big Data, Small Data is the Real Revolution. URL: http://blog.okfn.org/2013/04/22/forget-big-data-small-data-is-the-real-revolution. WhatIs. URL: http://whatis.techtarget.com/search/query?q=small+data. Last access: August 2016. D. Estrin (2014). Viewpoint: small data, where n=me, Communications of ACM 57 (4), 32-34. Based in the TEDMED 2013 presentation: What happens when each patient becomes his or her own “universe” of unique medical data? URL: http://www.tedmed.com/talks/show?id=17762. R. Baeza-Yates (2013). Big data or right data? In Proceedings of International Workshop on Foundations of Data Management, CEUR Proceedings, vol. 1087. M. Kavis (2015). Forget Big Data: Small data is driving the Internet of Things. URL: http://www.forbes.com/sites/mikekavis/2015/02/25/forget-big-data-small-data-is-driving-the-internet-of-things/#3635c7f0661b. M. Lindstrom (2016). Small data: The tiny clues that uncover huge trends. St Martin’s Press, NY, USA. F. Shilmover (2015). Forget Big Data: Small Data is where the money lies. URL: https://www.datanami.com/2015/05/20/forget-big-data-small-data-is-where-the-money-lies/. A. El Deeb (2015). What to do with “small” data. URL: https://medium.com/rants-on-machine-learning/what-to-do-with-small-data-d253254d1a89#.w01mkrich (Accessed August 2016). R. Kitchin (2013). Big data and human geography: Opportunities, challenges, and risks. Dialogues in Human Geography 79(1), 1-14. R. Kitchin and T. Lauriault (2015). Small data in the era of big data. GeoJournal 80, 463-475. Small Data Group (2013). The Year of Small Data. URL: https://smalldatagroup.com/2013/12/11/the-year-of-small-data/. Bio: Dr. Ricardo Baeza-Yates is currently CTO of NTENT, a search technology company based in Carlsbad, California, since June 2016; as well as Director of Computer Science Programs (part-time) of Northeastern University, Silicon Valley campus, since January 2018.